For his new book, Mario Pricken has thoroughly analyzed more than 300 products, objects and events over their entire lifecycles in order to reveal, for the first time, the patterns that make things extraordinarily valuable. On the basis of his analysis, he has identified 80 parameters that can be found, for example, in the biographies of exceptional cars, watches, luxury foods, designer furniture, artwork and services - such as the elements of uniqueness, scarcity, the effect of time or magnificently orchestrated transfers of ownership. In addition, the book provides a comprehensive catalog of questions to help us generate our own ideas for giving products that special something which transforms them into objects of desire. 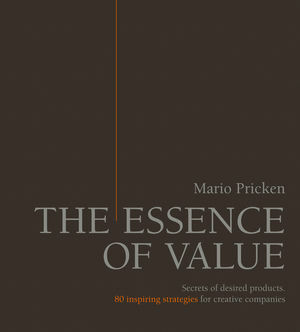 "The Essence of Value" is an inspiring book for progressive, creative people involved in product development, marketing, design, events and the arts as well as recommended reading for those who appreciate fine things and want to understand what makes products particularly special and valuable. The book focusses on intuition and understanding, but it also inspires and entertains, offering us an entirely new way of looking at the creation, marketing and purchase of truly desirable products. - reveals, based on examples from the worlds of business, the arts and religion, and with numerous accompanying illustrations, the fundamental parameters that create value and make products "shine"
- shows professionals a clear and practical application of the value parameters. As an innovation director und consultant, Mario Pricken inspires marketing departments, international companies, well-known agencies, design companies and television broadcasters. His bestseller "Creative Strategies" is an internationally recognized standard reference.